Content marketing is here to stay. Study after study show that businesses who are executing on a smart content marketing strategy are driving more web traffic, more leads, and more customers, all more cheaply than their counterparts who are focused on paid digital marketing. And if you’re a marketing agency, offering content creation as a service can increase your bottom line, keep clients on longer retainers, and drive better results for your clients. But, content creation is hard. In fact, according to Angela DeFranco of HubSpot, “Content creation is the hardest part of inbound marketing”. Because it’s hard, and because it doesn’t feel like the most urgent thing on your to do list, content creation often gets pushed back … and back. So, I’m going to make the case that businesses (and marketing agencies) should outsource content creation (or at least a chunk of it) and then delve into a quick framework for how to outsource content creation. Finally, I’ll suggest some resources for further investigation. Note: this section speaks primarily to business owners, executives, and marketers. If you’re on the marketing agency front, the logic is a bit different. For more on the agency side of the coin, check out this case study we did with a leading SEO agency going through the process of outsourcing content creation. The biggest stumbling block I hear from folks thinking about outsourcing content marketing efforts is something to the effect of “Content is personal. No one else can tell my story like I can.” (I hear this a lot, as I run marketing for Verblio (formerly BlogMutt). We’re a outsourced content creation platform. While that could bias me, I’ve done my best to present a measured argument, and make this article useful regardless of how you choose to outsource you content creation or content marketing.) This stumbling block has a lot of merit. Content is deeply personal, and finding someone else who can help you capture your story isn’t easy. They’ve come to the realization they simply don’t have time to create their own content (or all of it). They’ve realized that writing (or at least writing well or writing quickly) isn’t their strong suit, or their time is just better spent elsewhere. I want to do content marketing, but I don’t have time / I tried to but I couldn’t make the time, do the writing, etc. The only way for me to do content marketing is to outsource the work (or some of it). OK, so we’ve established one big part of the why. But there’s another, and it’s the same reason you’d consider outsourcing any aspect of your business, the same reason you try to bring talented people of any kind onto your team: outsourcing content marketing can bring a unique, expert skillset and new, powerful ideas to the table. Whether you’re outsourcing your accounting function, your facilities management, or your content marketing, your goal should be the same: find experts who will inject new, progressive ideas you haven’t thought of into your organization, and help you better execute on those ideas by delegating. Bring experts with new, big ideas onto your team. Now that we’ve established the why, let’s talk how. Here’s a four-step framework for outsourcing your content creation, based on everything I’ve learned over the past 6 years of creating content. Step 1: Assess your needs & budget. 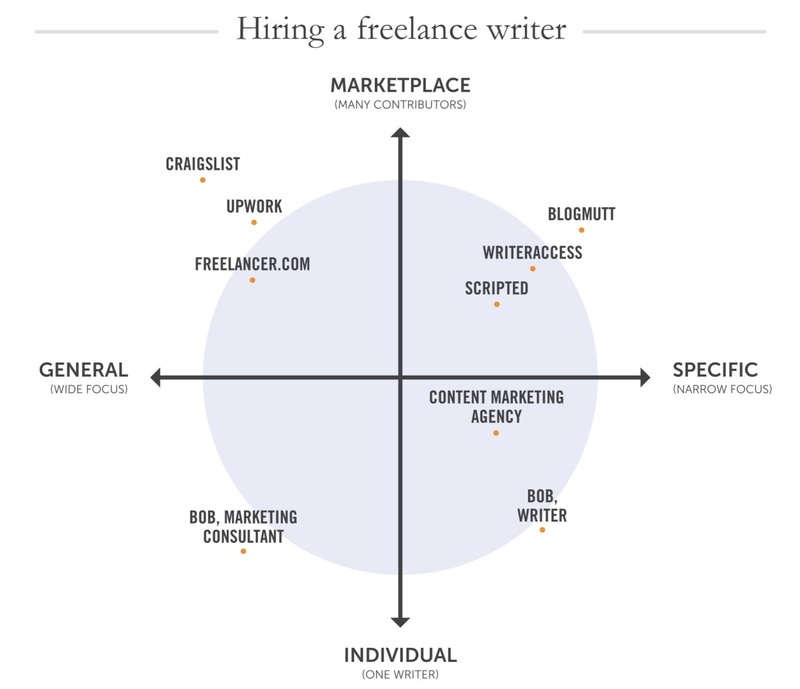 There are so many ways under the sun of finding the optimal freelancer to write for your business, and every price range to match. Starting with a budget in mind will help you understand which options are viable for you. Step 2: Test out working with your outsourcer(s). This includes setting aside a test project to actually get a feel for the way your outsourcer does business, in a far more telling way than just looking at samples from a writer’s portfolio or past work. This is how we vet all of our potential outsourcers to test working dynamics, finished product, editing rounds, etc. Any good outsourcer will solicit regular feedback and open communication lines along the way. And don’t limit yourself to just one—testing a couple of writers will give you a feel for what’s possible, what you like, and what you don’t. Step 3: Break out your content needs into buckets and account for scale. Think top-of-funnel, middle-of-funnel, bottom-of-funnel with your needs. What would you be comfortable outsourcing with minimal oversight? How does your outsourcing solution specifically fit into your content strategy? For example, on our own blog, a lot of our top-of-funnel content is outsourced to writers on the Verblio platform. Our middle-of-funnel content goes to a much more selective pool of freelance writers (sourced from the Verblio pool, by the way), and we keep our bottom-of-funnel or “big content” pieces in-house with our ‘blog team’ made up of those employees with a ton of blogging experience. As you design your outsourcing strategy, account for scale and volume increasing as you execute on a more robust content marketing strategy. Step 4: Arm your outsourcer with all they need to know about writing for your company. This includes outlines, applicable resources that you trust in your industry for solid, trustworthy information, all the way to a style guide of what you expect from content. We wrote more about this concept here, but a hint: over-communicate at the beginning. This will feel time intensive, but will pay dividends as you build relationships with your freelancers over time and save time down the road. Here are a few additional resources if you’re ready to learn more about how to outsource content creation. Our e-book, Ignite your Inbound Strategy with the Right Freelance Writers, delves deep into how to find, onboard, and work with freelance writers for inbound marketing. How a printing company outsourced their content creation and achieved Page 1 Google results. An almost-magic formula for getting great results from freelance writers. When I write content for our own content marketing, I try very hard to make sure it’s not too self-serving and is useful to folks whether or not they become a Verblio customer. I hope you found this blog post no exception. But, time for a quick plug about Verblio, because if you’re looking for a shortcut for how to outsource your content creation, we’re worth a look—we’ve spent the last 7 years building a product designed to do exactly that. You can learn more about how Verblio works here. Patience is necessary in outsourcing of any kind. Don’t expect to see immediate time savings, and don’t expect to get it perfect the very first time. Because of #1, choose an outsourcing partner that enables excellent communication with your writer(s), and allows you to test a variety of writers so you can find the subject matter expertise and the voice, tone, and writing style that’s a great fit for your business. Still have questions I didn’t answer? Happy to try and answer them.